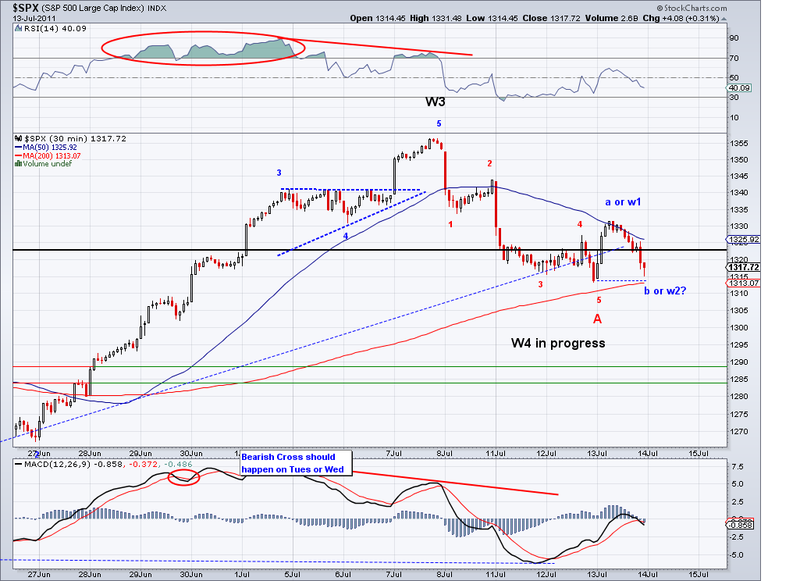 The market tested the 200 day ma and in the process invalidated the W1 intermediate count I had. 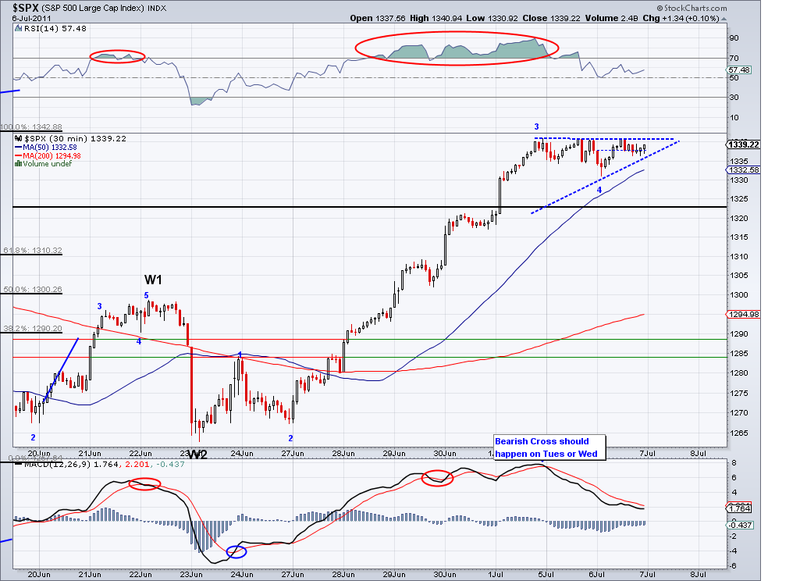 The structure now favors the point E of an triangle, which means the 5th minor wave should now start. I was really tempted to add to longs at the 200 day ma but I decided not to as the debt issue is an unusual circumstance. What I will probably do is load up at the 50 day which stands at 1312 and use it as a stop once the TA gets reached. 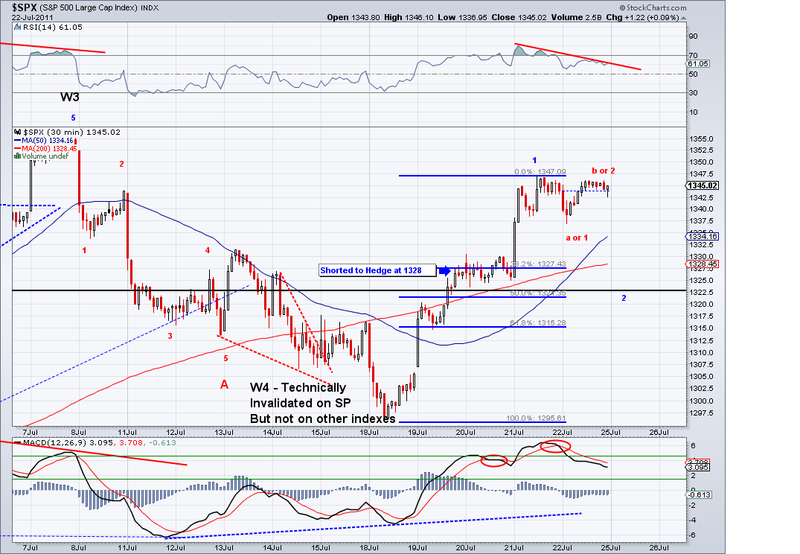 The TA btw is sitting at 1323 so it might take a day or two to get there before a pullback to the 50 day ma. I am glad they managed to agree on something at last! 1296 or 200 day ma? The market got closer to the 1296 level today and at this point its impossible to tell if it will hold (just like its impossible to tell if politicians can agree on debt and taxes). But like I said yesterday, I'm looking for 1296 or the 200 day MA at 1284 to hold and then rally. Looking at the waves, if 1296 its breached then the count would have these 5 impulsive waves down as part of a C wave or a bearish 3W.. it will all depend on how these levels hold. I find it interesting that several weeks of negotiation in Washington has yielded nothing. And if the US defaults, a recession and a major market correction will be likely. All because these guys can't agree.. they can't even agree with people in their own party. The market ended up having the bearish leg I had been looking for and it not only tested the TA and the 50 day MA but it broke them on a bearish/heavy volume day. So I make some changed to the labels to reflect the 5 waves today and now I am expecting a bounce in the next few sessions. 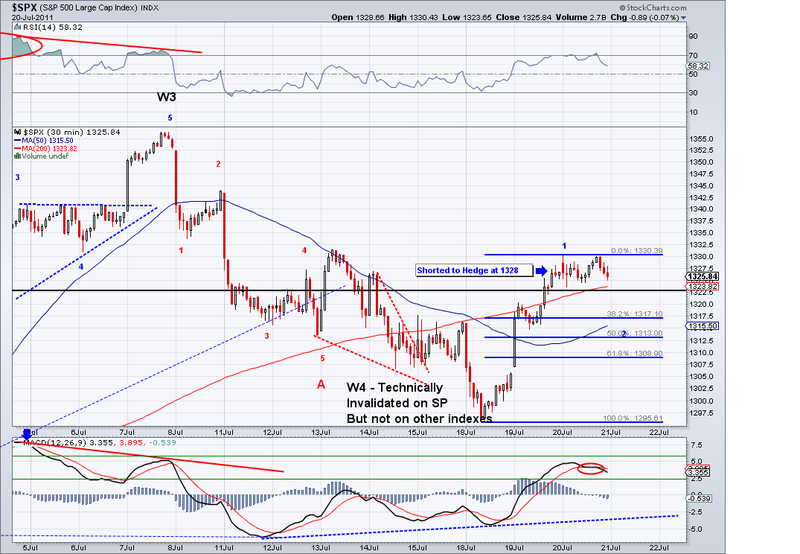 As long as the market stays above 1296, this is a valid W2 of a W3 of 5 Minor. I've been right on every single wave since mid June so hopefully I'll keep the streak going. Also from the Technical Analysis perspective, there is a potential inverse Head and Shoulders in play that targets 1440. So we should have an answer on the next bullish wave. 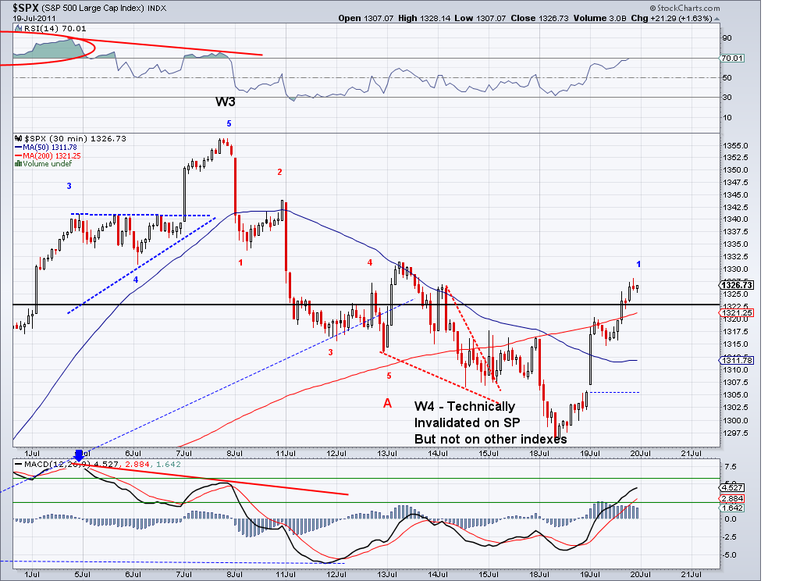 If it is indeed a W3 we should see it go straight to 1370 after this sell off. I ended up covering my hedge at 1321 expecting a double ZZ but I covered too early unfortunately. So now I am looking to add margin longs at levels as close to 1296 as possible and use that as my stop or perhaps the 50 day ma which sits at 1310. If 1296 breaks, I'd expect the market to find support at 1287 which would be an automatic margin long for me as it would be about 40 points from the Trend Average (an automatic long on sell offs and shorts on bull rallies). The market continues its correction and from looking at the charts it seems like it might need one final bearish leg to complete and double ZZ and resume the bullish trend. The issue of the debt ceiling might just be what the market needs to propel higher and until that issue is resolved, the market will continue to be in correction as investors are apprehensive about new positions. 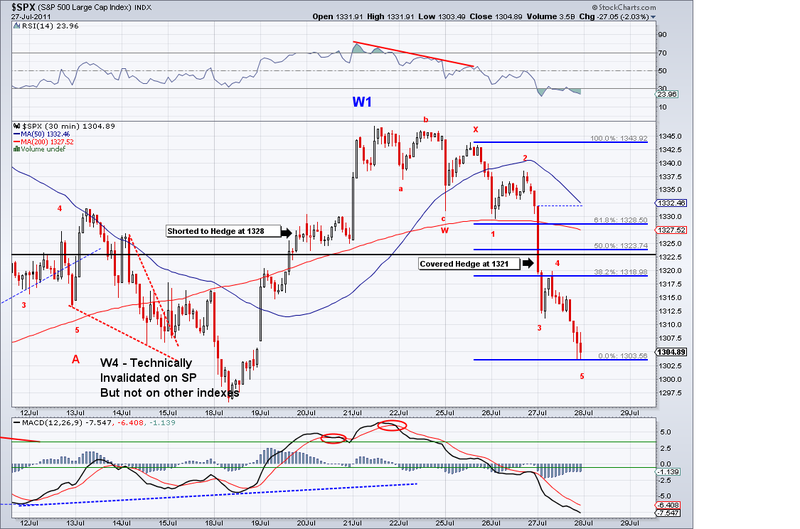 From the EW perspective, the market needs to correct to 1327 for a proper Fib correction. It has gotten close but maybe one more bearish leg will do to the 50 day MA and rally from there. 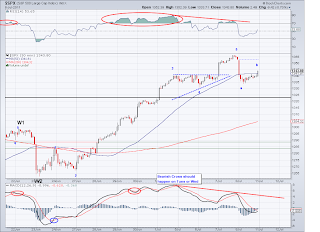 The market started the correction as I had been anticipating and it looks like there will be more selling tomorrow. 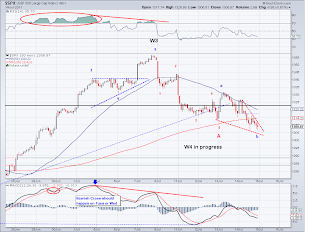 The waves are aligned in a bearish 1-2 set up, so we'll see what morning brings. 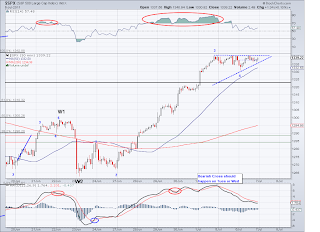 The market is still above the TA so there is nothing bearish as far as trend indicator goes. 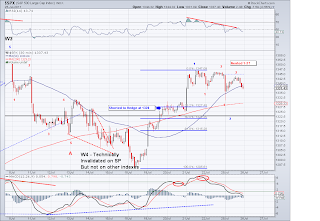 However, going by wave structure, TA tools, and the fact the government is deadlocked only helps the bearish wave. 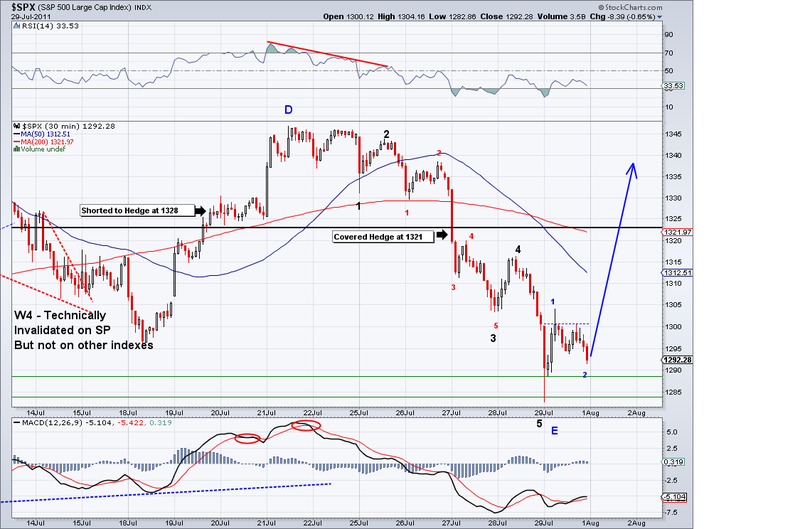 And as long as 1295 doesn't get breached, we should see a strong bullish wave after this correction is done. 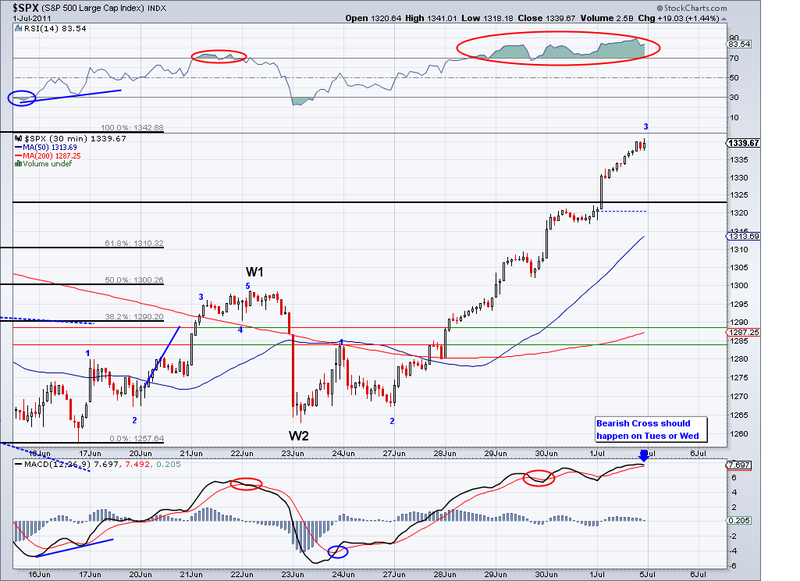 The S&P rallied further that I anticipated but still within a reasonable range. So I am still expecting a test of the 50 day MA and the TA which are both now exactly at 1323 early next week. If this test proves successful, which I think it will be, then we should see a wave that will challenge of take out 1370 once in for all. In the meantime, it will be interesting to see what happens with the debt ceiling issue. I just read that Boehner walked out of negotiations and that might just set off the correction on Monday. The market is almost done with W1 of minor 5 and I am expecting a correction that will test the Trend Average (1319)/50 day MA (1316) in the next couple of sessions. 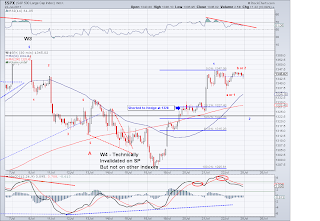 There are some EW analysts who are calling for a sub-1300 low before launching the minor 5 wave but I am personally inclined to think that we are already in it. I shorted (to hedge) at 1328 and will be covering and going long on margin when these trend lines get tested. The debt ceiling agreement might be the catalyst for a huge rally.. we'll see. 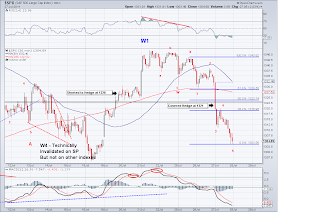 I posted yesterday that W4 had failed because of 1298 getting breached. 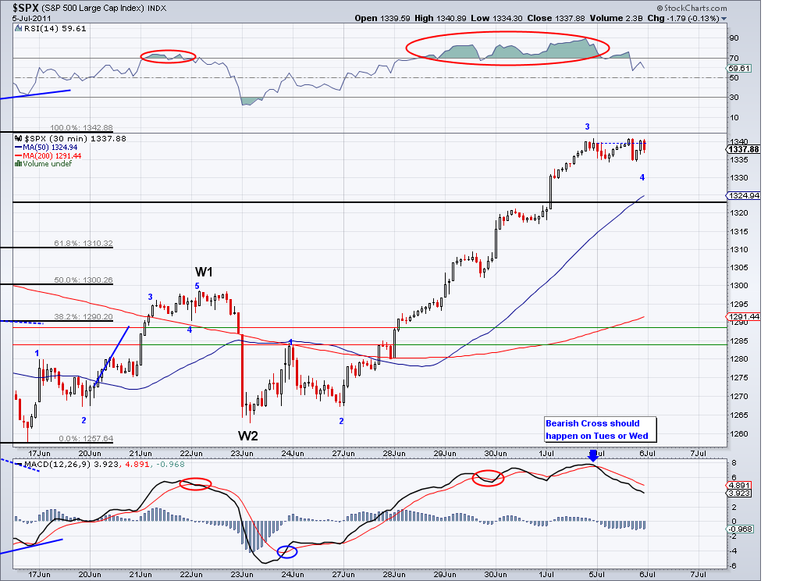 However, I was checking the other indexes (DOW, RUT, NASDAQ) and they all have valid patterns. So this will be a case where EW guidelines have to be accommodated to reality. I've seen these W4 fails where there is still a W5 afterwards and I am going with the assumption. EW in itself is a great guiding tool but I personally see flaws (such as this one) that have yet to be publicly corrected. 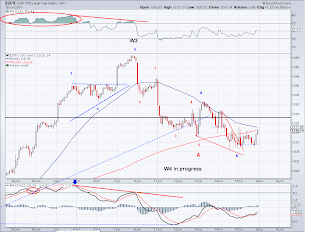 Anyhow, the bottom line is that this wave seems to be W1 of the 5th Intermediate Wave. So I expect a correction to start tomorrow or the next day to test the 50 day again and then we're on to a big rally. Also, the index closed above 1323 which is today's TA and as long as it stays over then we will see a rally that will possibly go as far as 40 points above it. SP1300 was tested as I had speculated but since 1298 did not hold, the count I had been tracking for weeks was finally invalidated. So I have to take a look at the overall structure and see what is the count that best fits the current price action. The market continues to be under the TA and under the 50 day ma, which are both bearish. So we will have to see how the market reacts to the debt ceiling issue in the next few days. The intermediate and long term are still pointing up so I am assuming we are at another correction as long as 1258 does not get taken out. I am waiting for either the 200 day ma to be tested again to go margin long or trade above the TA, which is now at 1324 and dropping a few points per day. The C wave is taking its time and I am getting the feeling that 1300 might be tested first before the C wave can take place. 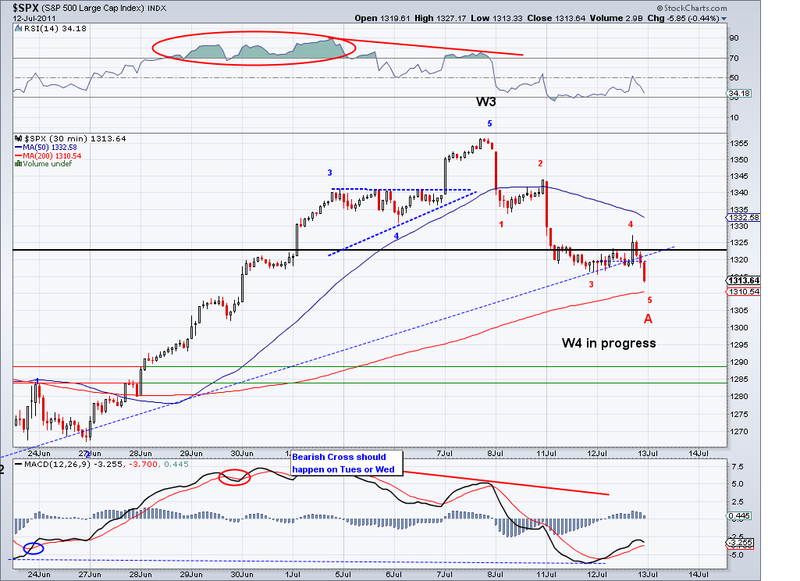 On my count, 1298 is the line in the sand for W4 so it will be cutting it close. With so much uncertainty on the economy and the debt ceiling, it's no surprise the market finds it hard to rally. However, if the there's some agreement on the debt ceiling I would expect a big relief rally. So this week is going to be an interesting one. The margin position I entered at the 50 day ma, got stopped out again. So I will just wait this out until there is more clarity. 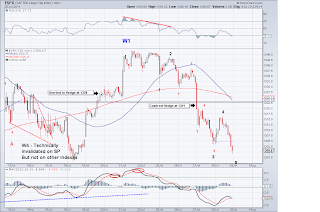 The market continued its volatility today and it closed under the 50 day ma, which in itself is bearish. However, the market continues to oscillate within a W4 correction territory so I will continue to assume there will continuation to the rally that started a few weeks ago. The fundamental picture is clouded with doubt over the debt ceiling, European debt, etc. And as soon as there is a positive (as positive as it can get obviously), it will serve as an excuse for a substantial rally. 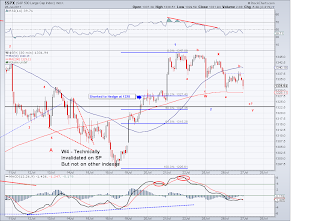 For now, the market is under the TA and the short term is bearish. I had a trigger error today and got stuck with my margin position (I put in 1117 as the stop instead of 1317..) so I am hoping for a bullish wave tomorrow or Monday. 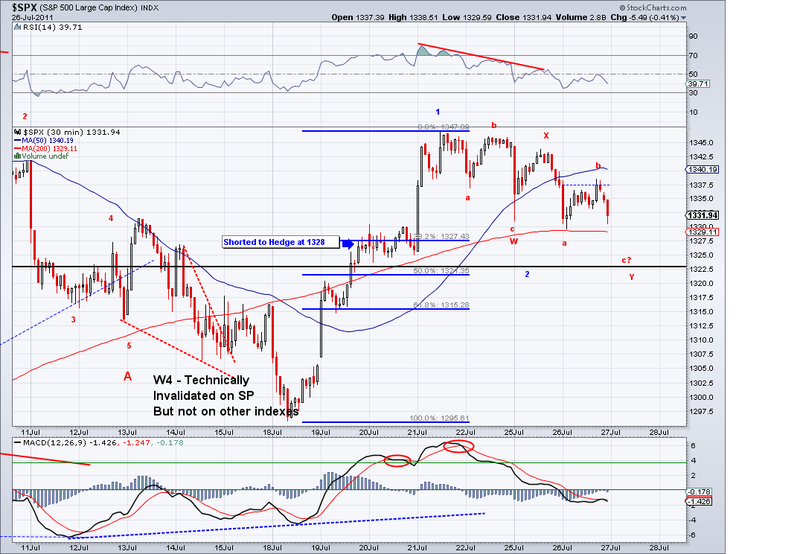 Also, is worth mentioning that 1298 is the line in the sand for this W4. The market managed to bounce and put in a higher high in the process and it seems to me like that wave could be an A or an W1. And the market closed just above the 50 day ma again in a B or W2 so how the market reacts tomorrow will be telling. 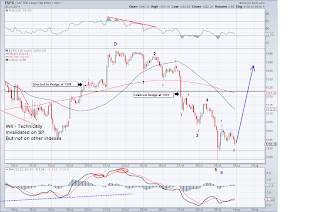 I expect the market to out in a higher low before resuming another bullish wave. However, looking at the MACD indicator, it looks like there is more downside to come overnight/tomorrow and I am hoping market support will hold. I entered a 200% position again at the close at 1316 and hoping this time I'll be able to catch the C or better yet a W3 wave. Yesterday I got stopped out by 1 point in the last minute of trading and missed out today's rally.. so maybe not this time. I am expecting the TA, currently at 1333, to be challenged again. 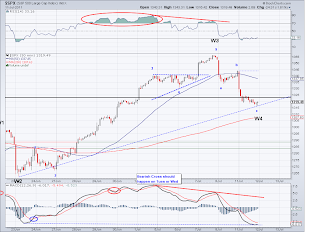 If the market can close above it, then chances are it is a W3 wave. The market plunged afterhours last night but in the morning it seemed like nothing had happened as the 50 day moving average held. 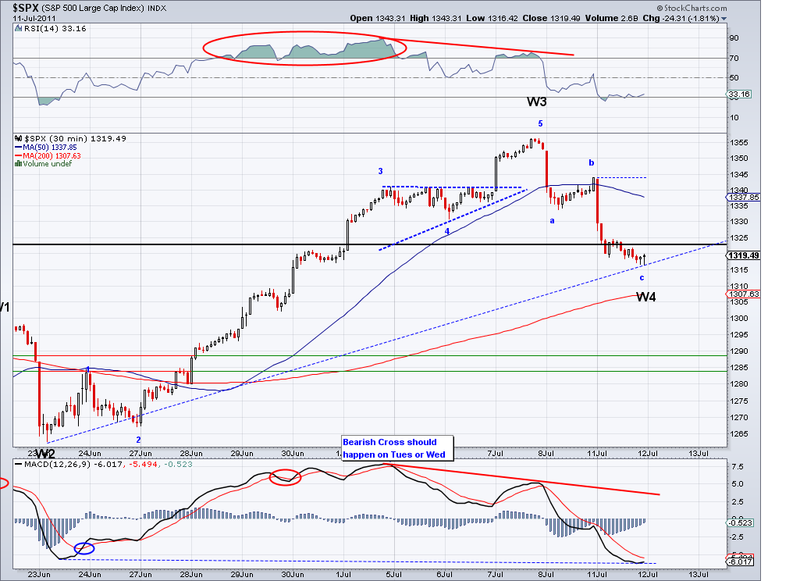 However, the close was bearish and it points to a 5 wave down from 1356 which would make this an A leg. 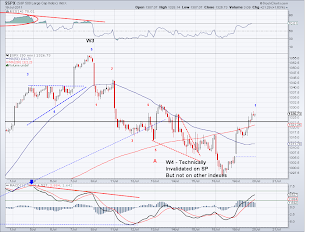 Given the fact that I have the W1 peak at 1298, that would technically be the line in the sand for this count. 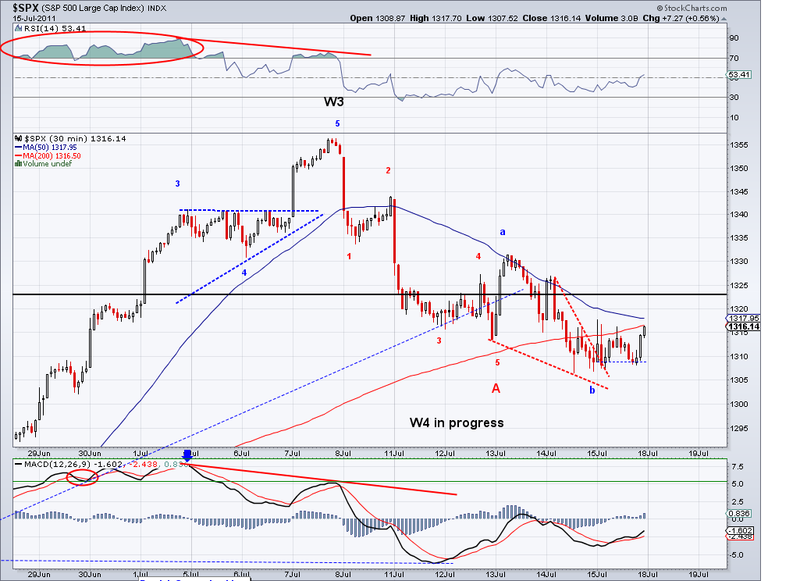 However, there is the possibility that the impulse wave from 1262 was W1 and not a W3. 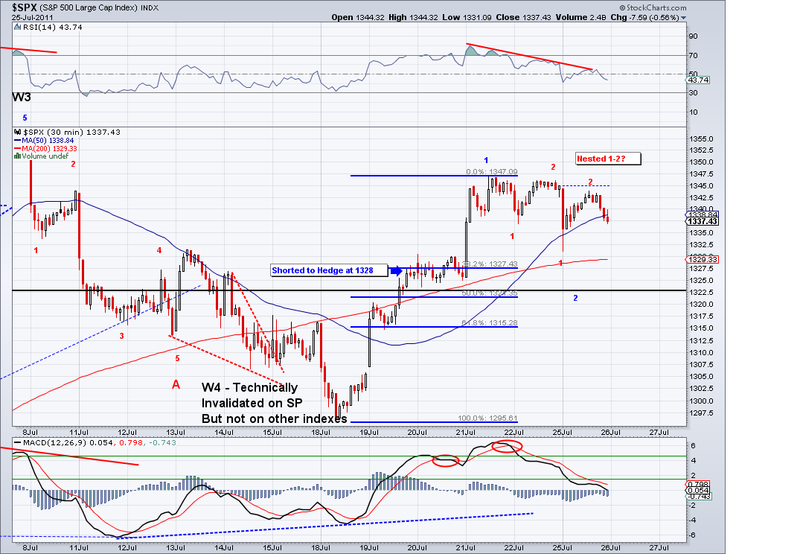 And if that is the case then the market has room to go all the way down to that level before going into a W3. 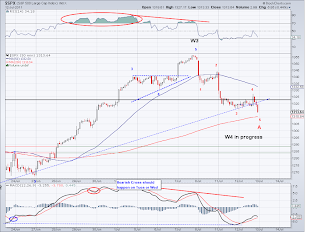 For now, I will trade it as an ABC move and we'll see where the market falls. If this is a W4, then it will have to be a Flat. 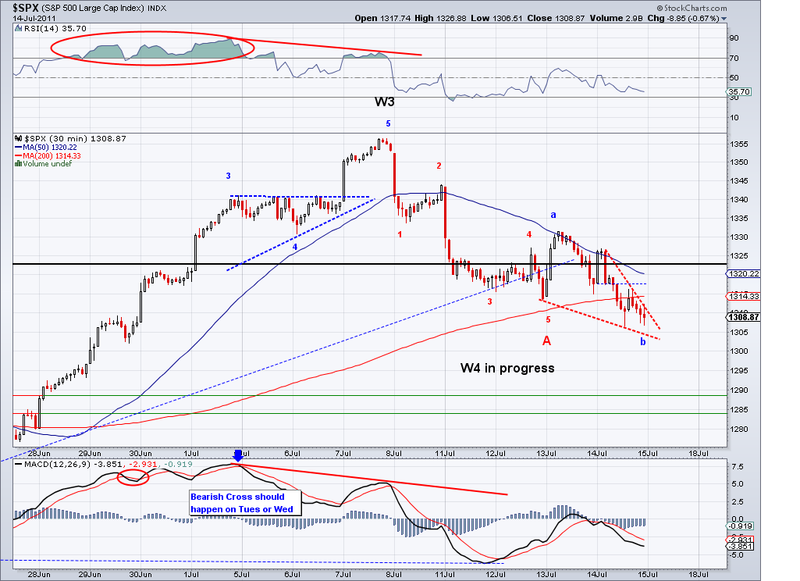 If this is a W2, then we will test the 200 day moving average again. I exited my margin position at the close since it went under the 50 day ma. I might pick it up again if 1300 gets tested to play the B wave and hope that it is a flat to get the most out of the trade. The market has continued to follow the count I first posted almost a month ago and as expected, the market tested the 50 day MA. What sort of W4 this is remains to be seen, we could start rallying as soon as tomorrow morning towards a new high for the year or continue on some sort of triangle before launching higher. I covered my hedge today at the TA and then went on margin (200% long) at the 50 day MA. And as long as we don't close under this trend, I will stay long on the margin portion. I expect the market to start a bullish wave tomorrow to test the TA, ideally it should close above this level and then make another 30-40 point run above it. If the market hesitates, then we'll probably need more time. I see bullish divergences so the market is looking for 1 final big leg before going into a somewhat substantial correction. 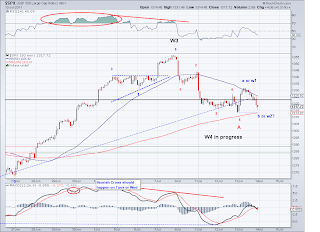 The W3 wave I had been tracking for the past couple of weeks is now done and we are seeing a corrective period before the market launches on a W5 to finish the impulse wave that started 3 weeks ago. Unfortunately, the market got closer to the equivalent of the 1360 level after hours so I didn't get a chance to short it. But it's no big deal, I am hedged so I am now looking for a lower low on a C wave that will perhaps test the TA and the 50 day MA which should be around the same level early next week. If we get there, I will cover the hedge and possibly re-margin again or just stay 100% long. It will depend on how the market gets there. Have a great weekend!.. this week went too fast. The market put in another bullish leg as I had been expecting and not only reaching 1350 but surpassing it with no problem. The 1345 level which I initially thought important was no obstacle to bulls, however getting over 1360 is going to take a bit of stretching so I guess we'll see in the next couple of sessions if there is enough in the bull tank. I wanted to go short at 1350 originally as that was my target but after seeing the substantial gap today, I decided to wait for the waves to clear themselves. And what I see now is that this 5th leg is done or about to be done with one more push towards the 1360 resistance. If there is that push tomorrow morning, I will take the plunge in shorting this leg of the market. I normally would not short a bullish trend like this but the market has a sign on its forehead that reads SHORT if I get to 1360..lol. 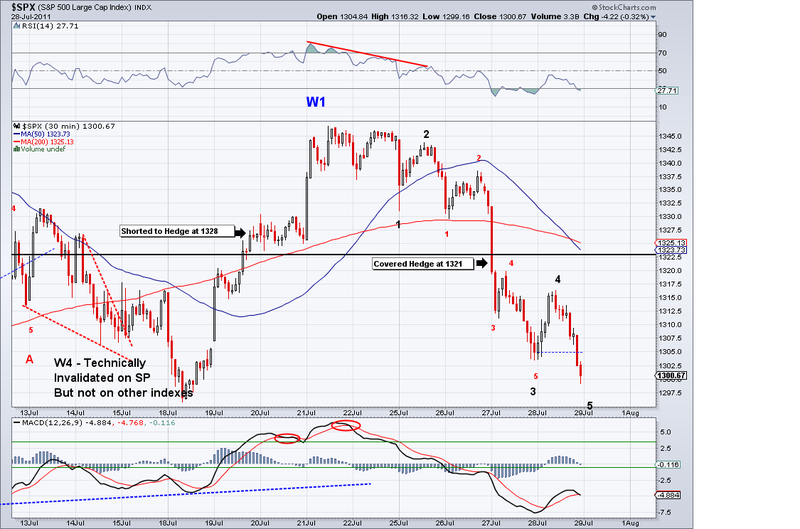 And at any rate, my stop would be 1361 so is not like I would be losing much if the trade goes against me. 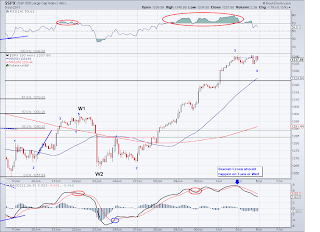 The market continued to consolidate today and now it has corrected enough in time to launch another bullish wave. Going by the count I have and what seems to be like an Ascending Triangle, the 1350 level might be reached on the next bullish wave so my plan is to go net short around that level (I'm current hedged as of 1332). And once we finalize this wave, I think we will at least test the 50 day DMA sometime next week. 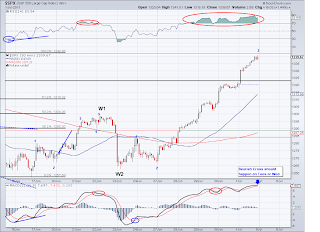 The market had a bearish MACD cross today that doesn't really show on tape, which is typical of a W4. 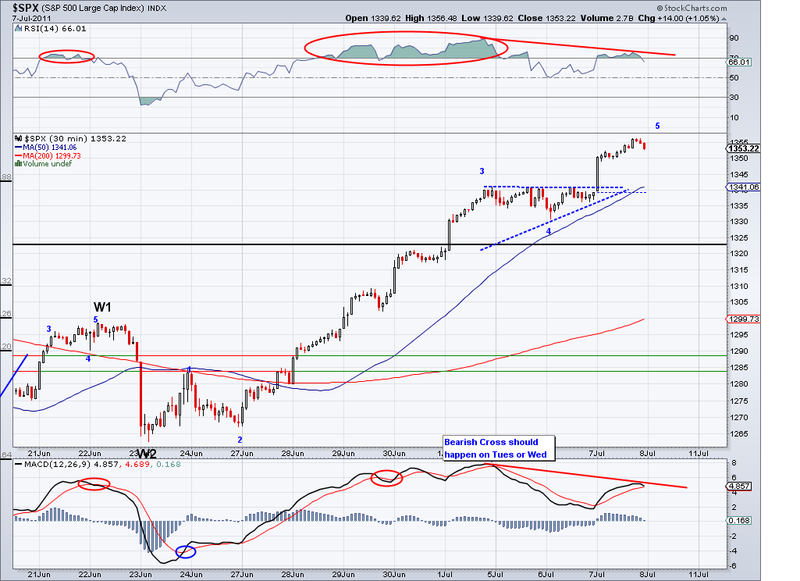 So I am expecting the market to correct a bit more and then launch another leg to challenge 1345. 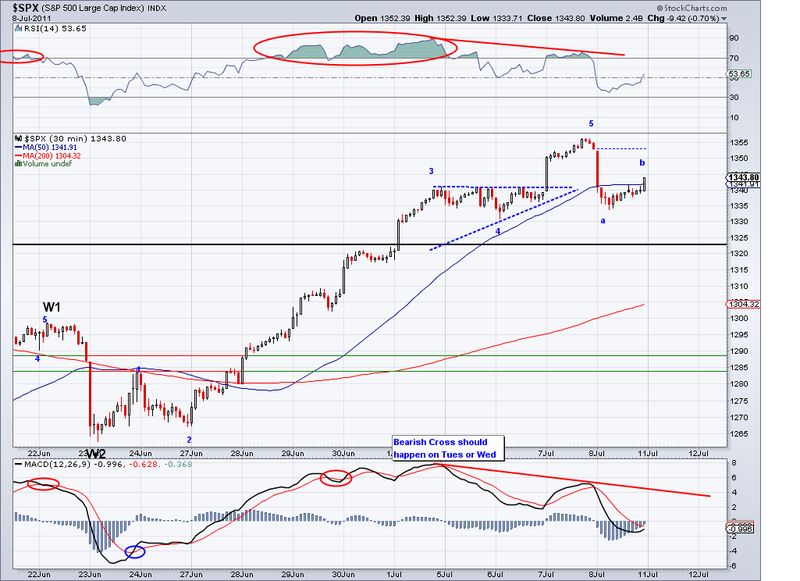 Ideally, the market should retrace to the 1325 area before doing this last leg but it's hard to tell at this point. I continue with my hedge and plan to either go net short at 1345 (or at a morning spike near that level) with a tight stop or cover my hedge at the TA. Whichever comes first, it's fine with me but the main plan is to re-margin at the next successful test of the TA and ride this bullish wave to 1400. 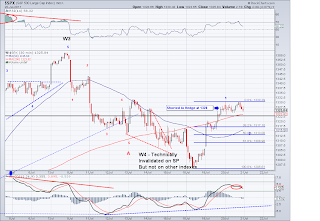 The market continued its bull run today in a W3. Last time I saw anything like this was in September 10 and I read in the news this is the best week for stocks in 2 years. So if anyone had doubts about the bullish trend, this week should settle it. The market is now overbought in the short term so I expect a pullback or a sideways correction starting Tuesday. If we get a pullback, I am looking for the rising TA as an entry point or alternatively the 50 day MA as many people who missed the action will get on board at that level. I went hedged at 1332 (shorted an equal amount to my longs) in anticipation of a pullback. Just like I said last week to expect a violent move once the market and the TA were within a few points of each other, whenever the market shoots up by more than 30 points (in this case 40), there is usually a pullback or sideways trading until the TA catches up with the market.